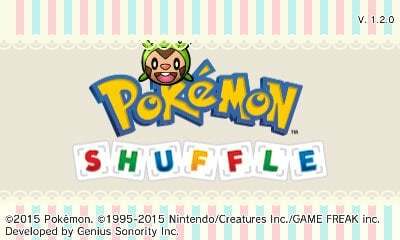 Pokémon Shuffle, the seemingly endless free-to-play match-three title on 3DS, has had plenty of updates, yet version 1.2 is now available and offers one of the most notable shake-ups to date. When trying to check-in you'll be told of a mandatory update, and in Europe the 686 block size suggests it's effectively re-installing the full game. Once installed it makes some key changes to how its played - hat tip to Serebii for clarifying some of these tweaks. Your heart stock is now split into two segments - the auto-generating section of five hearts and, separately, your stock of extra hearts that you've bought or redeemed with jewels. In essence this means that a stock of five hearts will continue to regenerate as you use extras. There are extra level indicators and numbers visible when optimising your team of 'mon, while Mega Evolutions can be boosted with their own level. 'Super Catch Mode' is a random extra opportunity that improves the odds of catching a 'mon. In multiple rounds we're yet to see it, so it's not overly frequent. 'Increased cheat detection', which the HOME button also disabled during timed challenges. Are you still shuffling day after day, and are you a fan of these changes? The home button patch is always welcome. That will make things fairer when the stone challenges come up. Those changes look pretty interesting. I took a break from playing for a while, but it's nice that they're supporting it well. I also liked the updates that Steel Diver: Sub Wars got. I had a super catch mode too. Good changes all round I think! I had never used the HOME button thing. I imagine I'll get a bit higher of a ranking in the competitions now.The split lives thing is quite welcome, as now I can save up my streetpass lives, without missing out on regenerating lives. I wonder what the max stock will be for these lives. Just downloaded the update and now I'm downloading Fullblox. Played the game 3 times. Didn't hold my interest. But those are good updates, especially the heart replenishing thing. Definitely interested to see what this means for Mega Evolution going forward. As somebody who has played too many match-3 games in their life the heart limitation was the only real weakness I've found in this game. I don't think I've ever gotten extra hearts before, but just the fact that they've added something to give you more means they realized it as a weakness. "There are extra level indicators and numbers visible when optimising your team of 'mon, "
If that means what I think it does it's a very welcome addition indeed. I use the optimize button every fight but I'm always wondering if a character is level 1 or level 6. Haven't played this - or any - causal games recently b/c the weather finally warmed up so I'd rather be outside, but the next rainy day I'll take this for a spin. What was the HOME button exploit anyway? Never heard of it before. @Captain_Gonru - Oh look, getting cloudy, may be rain in the forecast. Ooh nice. I like updates. @CreativeWelshman during time games, pressing the home button would pause the game, allowing you a few extra seconds to plan your next moves. I'm still playing but I'm also still stuck on Mega Mewtwo. Home Button exploit was a trick where you would press the Home Button during timed puzzle stages like the Mega Stone competitions and the expert stages. You would use the time it would take for it to pop you to the home screen and back to plan out your move. If you needed more time you could always open up Game Notes and have a clearer look on the bottom screen. Since the goal of the expert stages is to keep the momentum up, it was pretty easy exploit that made easy work of those stages. Also, kinda glad they fixed some of the bugs in this update as well, like Mewtwo actually appearing in the Mega slot whenever you optimize your team and searching by Mega Stone. That and the glitch on the Timburr stage where sometimes a Pokémon that goes mega left behind their non mega forms. That always irked me whenever I was trying to S rank it. Ha, never thought to use the Home button. Now I understand how those guys got such ridiculous scores. I got an 86% super catch, failed both times on the first shake. Finally caved and dropped $50 for gems last week to get the Lucarinite stone. Love this game. Gave up on that game about a month ago. I never used the home button cheat so I would of never known unless someone told me, but I am liking the heart update since I can also stock hearts obtained from Streetpass. Granted I tried it when I already have 5 hearts in the first segment, have to test it again when I don't. ^ I never had that problem on mine 3DS or my friends', so that's new to me. @Sparx Yep, that's also new. I noticed that myself once I finally caught Steelix thanks to my new Lucarionite. Anyone figure out how to level up their mega evolutions yet? Cool update. The super catch thing would have been useful before I went and caught the current 200+ available Pokemon... but I guess better late than never right? Mega Pokes getting their own levels is a bit of a game changer though. Not sure if it's worth the trouble of trying to grind some of them up or not, but definitely helpful. Loving all the new stuff with this update, especially being able to stock StreetPass hearts! Hearts update may make me back to this game. As for now I preffer Rumble World. so 10 hearts instead of 5 now? Sweet, so i get 300 coins farming stage 1 instead of 150.